Lobster Rope - The New England Trading Company, Ltd. THE ORIGINAL LOBSTER ROPE DOORMATS, Since 2009. Recycled Lobster Rope Doormats are colorful, made in USA fishing rope doormats handwoven from Maine float-rope used to tether lobster traps in the sea. Many fishermen switched to heavier sink-rope, which is safer to marine wildlife. 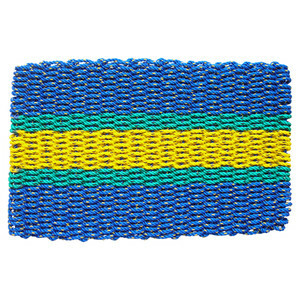 Now this reclaimed float-rope is woven into beautiful and durable welcome mats. Want NEW rope mats? Wicked Good, Nautical Stripes, and ColorWave Doormats are all handwoven in Maine using the same tough polypropylene nautical rope used by lobstermen. The new rope is more vibrant and has built-in UV protection. All Nautical Rope Doormats are some of the most durable, weather-resistant outdoor mats in the world. As seen on NBC's TODAY Show, HGTV Magazine, Better Homes & Gardens Magazine, ArchitecturalDigest.com, BobVila.com, MyDomaine.com, HuffingtonPost.com. NON-SKID SURFACES ONLY. The Best Weatherproof Doormat in the World? It may seem bold to suggest our doormats are the best in the world, but after 10 years of selling them nationwide, with less than 1% return rate...we think we've got a shot at the title. You don't have to live on the coast, or be a boater, to enjoy the beauty and functionality of a nautical rope doormat. In the summer they add a cheery warm welcome to the door and in the winter they simply pop out against all the gray. You can find heavy-duty, water-resistant doormats but most of them are dark, rubber, and less than inviting. Many have characteristics similar to our doormats but we haven't been able to find any that have them all. Handwoven in the US, our doormats take up to 1 hour to create, depending on the style. The polypropylene rope we use is heavy-duty so our mats can weight anywhere from 7 pounds up to 10, depending on style. Compared to the lightweight rope doormats you find elsewhere, ours are rugged and won't blow away with the wind. The raised rope weave cleans your shoes like nothing else and the mat still looks great afterwards. They won't take on an odor over time and they are completely water, rot, and mildew resistant. You will use yours for years to come - no matter what the weather. They must be placed only on non-skip surfaces (our use a rug mat underneath for smooth surfaces). When you purchase a strong, long-lasting doormat that not only does the job but keeps looking bright and cheery on your doorstep, you'll see it's worth the investment! © 2009-19. The New England Trading Company, Ltd. All Rights Reserved. Classic Harborside, Classic Harborside Tri-Color, The Original Lobster Rope Doormat, Lobster Rope Doormat, Colors of Maine, and ColorWave Nautical Rope Doormats are copyrighted trademarks of The New England Trading Company, Ltd.